Trace the epic story of New York through hundreds of atmospheric photographs, from the mid-19th century to the present day. This remarkable collection, now available in a popular edition, pays tribute to the extraordinary architecture, civic, social, and photographic heritage of the Big Apple. From the building of the Brooklyn Bridge to the immigrants arriving at Ellis Island; from the slums of the Lower East Side to the magnificent Art Deco skyscrapers, the city is laid out block by block, in all its chaos, complexity, energy, diversity, and style. Featured photographers include such feted talents as Berenice Abbott, Weegee, Margaret Bourke-White, William Claxton, Marvin E. Newman, Ralph Gibson, Steve Schapiro, Peter Lindbergh, Lee Friedlander, Nan Goldin, and Ryan McGinley. With cover art by Robert Nippoldt, the collection is complemented by an extensive appendix showcasing some 100 books, movies, and records inspired by the city that never sleeps. Even though I left New York in 1976 and have no desire to live there again, it still holds a special place in my heart. So you can imagine how happy I was when I found this large picture book in the library. 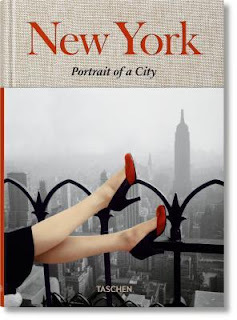 Each section starts with a brief and interesting overview that had me going off in tangents reading about the city’s history, significant and little-known events, and the backgrounds of the photographers who shot this collection of gorgeous color and black and white images. There were photos by Jacob Riis, Berenice Abbott, Alfred Eisenstaedt, Walker Evans, Weegee, Esther Bubley, Jamel Shabazz, and others. There was a brief mention of the 1904 steamboat fire that caused more than 1,000 people, mainly women and children, to perish in the East River. This was the city’s worst disaster in lives lost until September 11, 2001. I learned about Ninalee Craig's death in 2008. She was the subject of Ruth Orkin's controversial photo, American Girl in Italy. I’m sad that most of my years in New York were during the Mean Streets era. During the 70’s there were cuts to the police force and a significant increase in crime. Many friends moved to other parts of the city or the suburbs. The subways were a mess. Graffiti, garbage and the stink of urine were everywhere. The city cleans up well and even my old neighborhood in the Bronx looked fresh and felt a lot safer than the place I left. Still, I’m afraid all this gentrification has leached the character from New York and other cities and made them unaffordable for many. If you’re interested in New York, you will not want to pass this up. At the end are recommendations for viewing, listening, and reading.